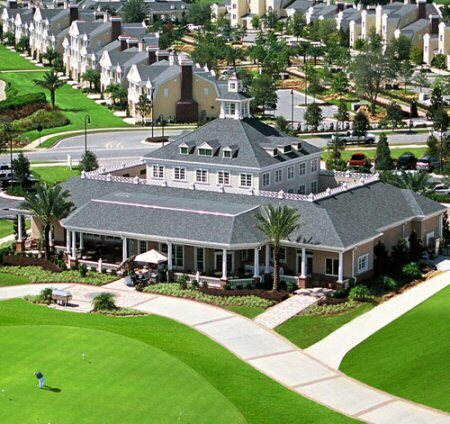 Reunion Resort & Club of OrlandoSM has been called America's new breed of family resort towns. Meticulously planned with the relaxed, laid-back atmosphere of small-town USA, Reunion offers a liberal blend of recreation and entertainment to create an authentic residential community unmatched by any other Central Florida resort. 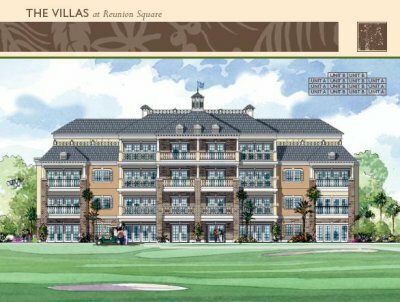 Upon completion, Reunion Resort & Club will include up to 8,000 varied accommodations in the form of single family homes, condominiums, and townhomes, all located conveniently among unparalleled resort quality amenities. Clubhouse: Features a full service restaurant and lounge, pro shop, driving range and putting green. Second clubhouse planned. Tennis: Tennis complex will feature lighted courts, fully equipped pro shop, teaching pros, league play and seasonal tournaments. Pool House: Includes swimming pool, fitness center, two outdoor Jacuzzis, activities center and pool bar and grill. Interactive Water Park: Features a collection of pools, two twisting turning water slides, a lazy river, cascading waterfalls, private cabanas, an ice cream parlor and a state-of-the-art video arcade. Kids CrewSM: Unique recreation program for kids of all ages incorporating sports, games, arts and crafts and swimming. Walking & Biking Trails: Miles of dedicated walking and biking trails with scenic vistas at every turn. Reunion SquareSM: Will offer unique dining, shopping and recreational opportunities for all ages centered around the multi-level, interactive Water Park. Location: Located in Osceola County, 25 minutes south of Orlando; 25 minutes from the Orlando International Airport; minutes from the four Disney theme parks and all the diverse recreational activities. Homesites available in various neighborhoods including homesites on the Signature Golf Courses designed by legends Arnold Palmer, Tom Watson and Jack Nicklaus. At Reunion, the emphasis is on community, and here you’ll find individual neighborhoods, each with its own unique amenities, including parks, pools and more. Homesites begin in the mid $300,000s to the $700,000s. Bradford Development, Continental, Inc., Arthur Rutenberg Homes, PSG Construction, Homes by Carmen Dominguez, Sunshine Custom Builders, Vallery Custom Homes, and Lexington Homes - can help you visualize whatever details and architectural styles you may have in mind. They offer a wealth of ideas, incorporating Reunion’s classic architectural motifs and the highest quality construction to turn a vision into a reality and a house into a home. At Reunion, there are existing custom and model homes available for purchase today—ranging in size from 1,400 to over 4,000 square feet, featuring diverse architectural styles and constructed with high quality materials. These homes are ideal as primary residences or vacation getaways. Existing custom homes generally range in price from $625,000 to $2,100,000. What makes Reunion so spectacular is the depth of thought that has gone into every single detail, and our condominiums are no exception. These units range in size from approximately 730 square feet to more than 2,000 square feet, and offer a choice of features, locations and several spacious floor plans. Condominiums range in price from $585,000 to the $700,000s and offer the ideal home base from which to enjoy all the amenities and recreational opportunities at Reunion. At last, reservations for the highly anticipated Condominiums at Reunion Square are NOW being accepted! Reunion Square will be the pinnacle of this epic community: it’s envisioned as Times Square and Central park coming together with a full host of amenities, service and pure energy. Reunion Square will be a hub for dining and shopping experiences, entertainment venues, kids’ and teen centers, along with the main attraction – the Water Park offering multiple pools, waterfall, a lazy river and a children’s Water Tower. The Condominiums at Reunion Square will offer spacious one-, two- and three-bedroom condominiums, offering the first “waterfront” ownership opportunity at Reunion. 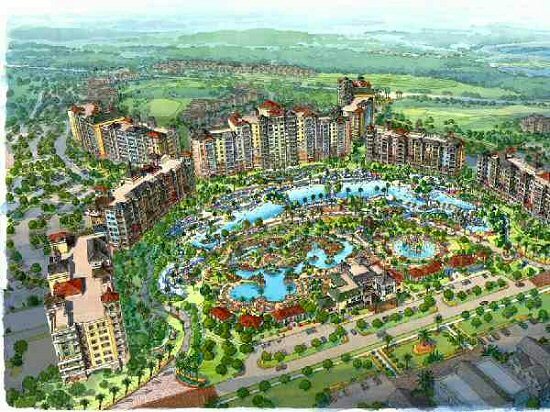 Each condominium will feature a spacious balcony, offering incredible views of the Water Park or the Tom Watson Signature Course, Independence. Prices start in the high $500,000s. 3 BED 3 BATH TERRACE 1771 SQ. FT.
3 BED 3.5 BATH TERRACE 1780 SQ. FT.
1 BED 1 BATH TERRACE 876 SQ. FT.
2 BED 2 BATH TERRACE 1300 SQ. FT.